As we admire the bits of nature in our neighborhoods, it’s also an opportunity to think more broadly about our responsibilities to the large eco-systems that we are part of. How do our practices at home impact the food we eat? What we can we do to ensure that our food is grown more in harmony with nature? I am not exaggerating when I write that we are at a critical junction as to whether we continue to be part of an industrial food system that threatens our future food. Our food supplies are wholly dependent upon our ensuring healthy and clean (and non-renewable) soil and water, which have been severely degraded due to industrial agricultural practices (e.g. toxins, pesticides, mono-cropping and erosion). As the Land Institute explains, agriculture “is the single human activity most responsible for dismantling the biodiversity that makes life as we know it possible.” We can “liberate” ourselves from industrial food, starting this Pesach by choosing seder ingredients that are raised, grown, outside of our industrial food systems. The dish that I prepared is reflective of the Israelites passage from their constricted life as slaves in Egypt to the Exodus. I used an array of fruits to represent the flourishing Spring season. The entire dish is drizzled in pomegranate molasses, which is a bit tart, to represent the pains and bitterness of enslavement that we experienced and the aspects of enslavement that we still carry with us. 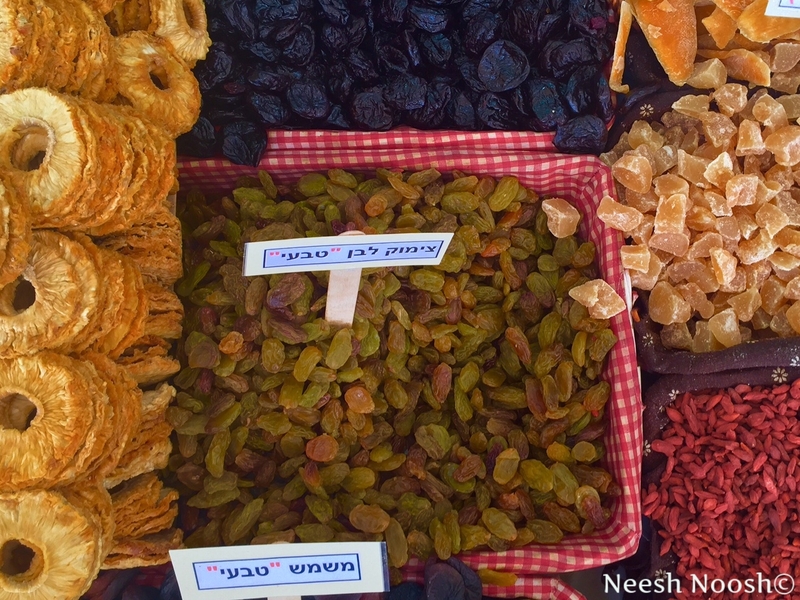 Raisins and other dried fruits. Shuk Hanamal. Tel Aviv. 3. 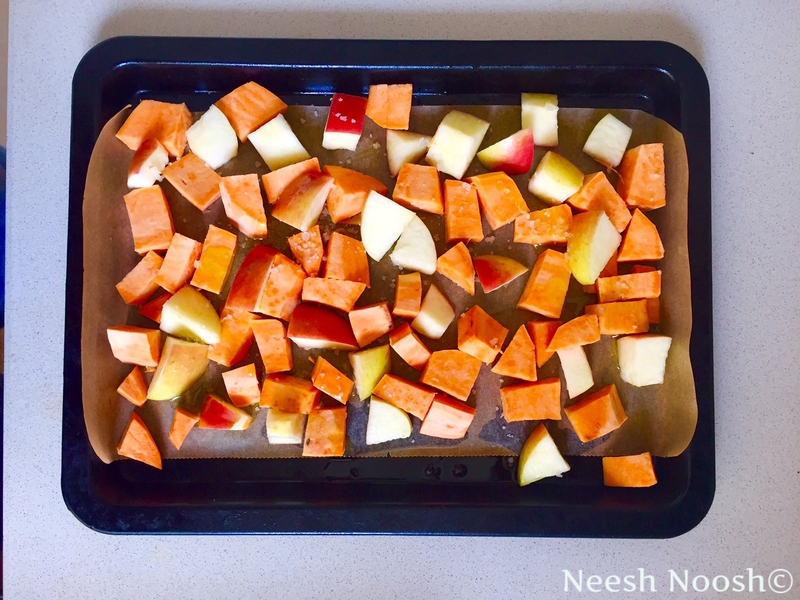 Wash apples and yams. Peel yams. Chop into small pieces and arrange on paper lined tray. Drizzle with olive oil and salt. Bake until soft and slight browned, about 40 minutes. When done, remove from oven and let cool slightly. 4. In a bowl, mix dates, raisins, apple and yams. Add more salt, if needed. 5. On a platter, arrange quinoa in a long, narrow pile. Place fruit mixture at the end in a slightly encompassing circle. 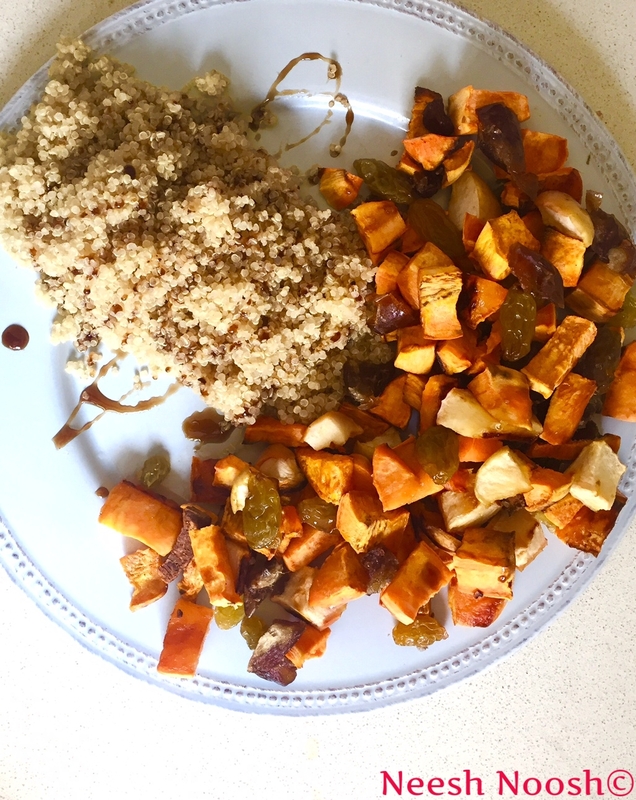 Drizzle quinoa and fruits with pomegranate molasses. This entry was posted in Entree, Fruit, Months, Nisan, Passover, Pesach and tagged biodiversity, cooking, Nisan, Passover, Pesach, recipe, Rosh Chodesh, soil, Spring, vegan, water by Sarah Newman. Bookmark the permalink. Sarah, this is lovely. A friend from India is visiting in a few weeks. She’s a vegetarian. That’s a challenge for a carnivore like me. I’m going back through your recipes. Great imagination. Looks perfect. Thank you Sarah. You created a lovely healthy feeling in this wonderful blog. And thanks for mentioning how we really need to eat and raise foods that are in harmony with our planet.